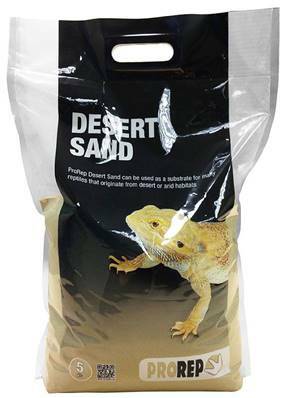 A completely natural sand, the ProRep "Desert Sand" is ideal for those species that like a sand substrate. ProRep Natural Desert Sand is made from pure natural un-dyed silica sand, ideal for adding that splash of colour while keeping a natural look. As it is undyed the colour will not wash off, fade or transfer to the animals living on it. It is ideal for any animal that requires a sand substrate, including burrowing species. Being mineral based it will not rot and so can be dampened to provide areas of higher humidity. Spread on the base of the vivarium to the required depth and spot clean regularly. Completely change the substrate when required.